Trees of Mystery is a roadside attraction and "tourist trap" in Klamath, California, about 35 miles south of the Oregon border. 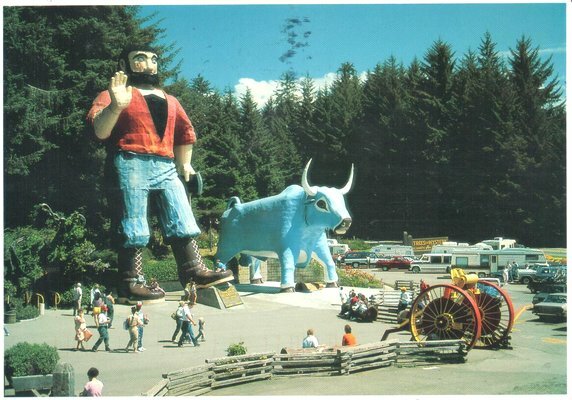 Trees of Mystery is best known for the 49-foot-tall statue of Paul Bunyan and the 35-foot-tall Babe the Blue Ox, both of which are visible from Highway 101. Constructed largely of wooden beams, chicken wire and stucco, the current Babe was built in 1950 and the current Bunyan was built in 1961. The original Bunyan was built in 1946 but was destroyed by rain that winter. In late 2007, the 1000-pound, 9-foot-wide head of Babe fell to the ground as a result of rotting materials damaged from rain. The head has since been replaced.